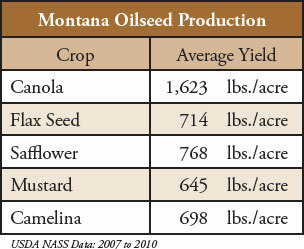 In 2010, the most commonly produced oilseeds in Montana were; canola (17,500 acres), safflower (28,000 acres), flax (15,000 acres), camelina (9,900 acres) and mustard (16,500 acres).1 Montana farmers also raise a small number of acres of other oilseed crops such as sunflower and soybeans. In other parts of the country, cotton seed, peanuts and other crops are processed for oils. How much oil is produced per acre? Example: 1 acre of camelina yielding 698 pounds with 35% oil content processed with mechanical extraction technology with a 75% recovery rate would result in 183 pounds of oil (698 x 0.35 x 0.75 = 183). A gallon of vegetable oil weighs approximately 7.5 pounds (this varies depending on the type of vegetable oil). By dividing 183 by 7.5 we can estimate that 698 pounds of camelina seed will produce approximately 24 gallons of oil. Two types of processes are used to separate oil from an oilseed. The first process is mechanical extrusion, in which the seed is mechanically pressed, allowing the oil to be separated from the meal. The second process is solvent extraction, which is often used in conjunction with some form of mechanical extrusion. The solvent extraction process applies a solvent solution to material that has been pre-pressed. The solvent bonds to oil in the pre-pressed material and an oil laden solvent solution is then separated and further processed to separate the oil from the solvent. Mechanical extrusion typically recovers between 65 and 80% of the oil contained in a seed. Solvent extraction recovers over 95% of the oil contained in a seed. Solvent processes are generally only used in plants with daily processing capacities of over 200 tons per day. Oilseed processing equipment with a capacity of less than 50 tons per day typically employs a mechanical extraction process to separate the oil from an oilseed. Mechanical extraction processes apply pressure to separate oil from the meal in an oilseed. A common method for applying mechanical pressure is through a screw press. Mechanical extraction processes have two main elements. The first is seed preparation. Seed preparation methods vary depending on seed characteristics. For example, seed preparation for canola often is limited to seed cleaning while other oilseeds may need to be cleaned, de-hulled, cracked, rolled, and/or flaked. Additional equipment may be required to complete seed preparation. A producer should identify the oilseeds that they are likely to process in order to determine exactly what equipment will be needed. The second element is the removal of oil from the oilseed. In a screw press operation, seed is fed from a hopper into the screw press, which uses pressure to force oil contained in an oilseed through small openings in the side of the press. Meal that is too large to exit through the small openings is extruded through larger openings at the end of the press. Screw presses are capable of removing approximately 65 to 75% of the oil contained in an oilseed. Some mechanical presses preheat seed as it enters the press. Preheating may increase oil recovery rates up to 80%. Alternatively, if seed is processed at low temperatures (for example, below freezing) oil recovery rates may be less than 60%. Actual recovery rates will depend on press quality, press operation, seed quality, seed type and seed temperature. Equipment retailers may include various accessories with the basic processing equipment. It is important to consider exactly what equipment is included when comparing offers. The following is a list of basic equipment used for oilseed processing. Required seed preparation equipment varies, depending on the oilseed to be processed. For some oilseeds (for example, canola) very little seed preparation equipment is required. For other oilseeds, (for example, sunflower) additional equipment is required to remove hulls. Equipment manufacturers and retailers can assist producers in determining equipment requirements for a particular oilseed. One of the largest capital expenditures for a small scale oilseed processor is the mechanical extraction press. These presses may be sold either with or without a power source. Small scale oilseed processing equipment is often sold without seed storage bins, meal collection bins, and oil storage tanks. Some buyers may utilize bins and tanks they already own to reduce their capital costs. However, some retailers offer complete systems that include a press, tanks, bins and a power source. Installation, delivery and set up costs should also be considered. Shipping costs can be substantial because of the size and weight of presses, bins, and tanks. Purchasing bins and tanks from a local supplier may reduce shipping costs. Oil needs to be stored and filtered as part of the process, pipes, valves, tanks, pumps and filters may have to be installed for storage purposes. Most oilseed processing equipment is electrically powered. Installation may require modifying or upgrading a buyer’s current electrical system to accommodate the new equipment. Installation costs are sometimes overlooked but they can be an important consideration. Operating costs vary widely among different sizes and brands of processing equipment. Labor costs are one important source of these differences. Some presses are designed to operate without direct supervision. When direct supervision is not required, a press can be operated for hours without substantial labor requirements. Other presses require approximately 5 minutes of labor per hour for monitoring and other purposes when the press is operating. Although this may seem like a small amount of time, it requires the operator to remain relatively close to the press during its operation. Another consideration is the output per unit of labor input. For example, a 2-ton press requires essentially the same labor as a 5-ton press. This implies that on a per ton basis, labor costs for the 2-ton press would be 250% higher than for the 5-ton press. Commercially available mechanical processors have daily processing capacities ranging from less than one ton to over 50 tons. Several important issues should be evaluated when determining the correct processing capacity for an operation. The capacity of the processor and the hours of operation determine the amount of seed that can be processed. Commercial plants often operate 24 hours per day for over 300 days each year, but smaller processors may operate for less than 12 hours per day and only a few months each year. 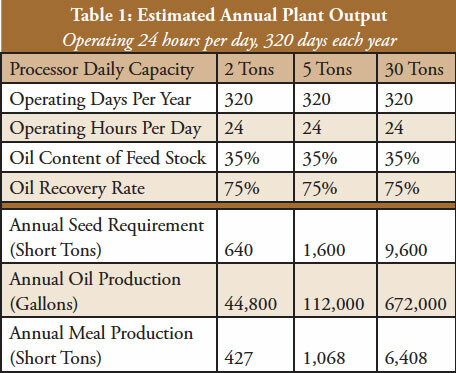 Table 1 presents estimated annual processing volumes for three processors with different capacities, assuming that each is operated 24 hours a day for 320 days each year. 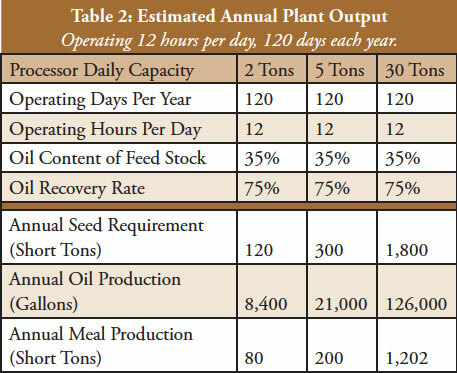 Table 2 presents estimated processing volumes for the same three processors under the assumption that each is operated 12 hours per day for 120 days each year. These tables also provide estimates of the quantities of products produced by each processor. An important issue for small scale oilseed processing operations is the required volume of feed stock. Farm based processors may be able to produce all or a significant portion of their feed stock requirements. Larger processing facilities will need to purchase most or all of their feed stock from other sources. Estimating on-farm oilseed production and the commercial availability of oilseeds in the region is a critical step in the planning process. Oilseed processing produces two products, oil and meal. Oilseed meal is generally used as a feed product for livestock. The oil has a variety of uses, including human consumption, biodiesel, bio-lubricants, cosmetics, and many other applications. Meal comprises over 60% of the seed processed. Identifying markets or uses for the meal before processing large amounts of feed stock may prevent storage and disposal problems. The characteristics of an oilseed meal are determined by the oilseed processed and the oil content of the meal. The characteristics of the meal produced vary. Thus, consideration of available markets for each specific meal product is important. Establishing local markets for the meal and seed reduces transportation costs. If local markets for meal are only available seasonally, additional meal storage may be required. Oil extracted from an oilseed has numerous potential uses. Human consumption markets for the oil are often niche markets that offer high prices, but only for limited quantities. The bio-fuel market usually demands higher quantities but offers lower prices. If the oil produced from an oilseed is to be used for human consumption, a producer’s processing equipment must meet State of Montana health and safety standards. Information about wholesale food manufacturing standards and other related issues is available on the Montana Department of Health and Human Services Web site (www.dphhs.mt.gov/PHSD/Food-consumer/food-safe-index.shtml). Oil produced for industrial uses, such as bio-energy or bio-lubricants, is not required to meet these standards.